It was the end of our summer time together. My sister and I had a van FULL of kids, hers, mine and our brothers’, parked in my grandmother’s driveway. Over the years it had gotten progressively harder for me to say goodbye to my grandmother. Each year I wondered if this would be the last time I’d see her. This year she was 99, standing in front of her cottage, coming out to watch our precious cargo get settled into the rented van. She stood there — old but not fragile — soft, but also solid as a tree. The most beautiful woman in the world. I approached her, her arms wide open — mine open to meet her — oh Granny, thank you for everything… this is goodbye until next summer. Tears welling in our eyes. A hug that I never wanted to end. But then the clammering in the car called to me, reminding me of the long journey ahead from Maine to the ferry in New London Connecticut to finally Long Island. We released each other, I scrambled into the driver’s seat, feeling relief in the obvious distraction of all these kids needing me. The clear responsibility in front of me served to keep me moving. Pulling away, I was stunned, my breath hard to catch… How did she always know exactly what to say? … Courage!? That one word said it all in that moment. On one level my sister and I would need obvious courage to face the ten hour drive ahead with the car full of excited and soon-to-be-exhausted kids. But Granny also knew that I’d need courage to leave her. And that she’d need courage to say goodbye to this car teaming with life, love and respect for her. That realization pierced my heart and took my breath away. She might also have meant the courage she mustered everyday being an ancient person in a world that valued the shiny and new. The courage to face the day without all of her many dear friends who’d died over the last 10 years. The courage to face each day with deep curiosity, interest in and love for her family and the broader community whom admired and loved her. I haven’t spent much of my life considering courage in personal terms. I reserve it as a label for those serving in war, putting out fires, or responding to other of life’s emergencies. But then there’s my sage Grandmother declaring what is also real: the everyday ways we face life with courage or that life requires courage of us. I’ll never forget when my first son was born. Holding the warmth and deliciousness of him in my arms only hours after he arrived, I was in awe. What had I gotten myself into? Looking down at him, I knew that my life would never be the same. And not in the over-used cliche way, but in the most substantial way. The way most parents — if they’re lucky — come to understand their new responsibilities. My life was no longer about me. I now had the impossible task of keeping another human safe at every turn. How could I bear the pain of him being hurt, physically or otherwise? He was the most precious person and it would be my job to keep him safe. I knew I’d jump in front of a bus, no second thoughts, to protect this new being in my arms. At the time, I didn’t connect this with courage. But now, jumping in front of a bus sounds like that huge kind of courage reserved for heros. Of course, we can’t sustain the level of awareness I had that day in the hospital, but it’s still there — just under the surface — fear mixed with courage. And it’s what gets us through everyday of our parenting journey. What if we claimed this courage, not in a braggadocious way, but rather as a deep knowing that life’s most meaningful choices take courage? I’m curious if and how this would change my feeling of agency, of possibility for myself as a parent. Rather than just rolling out of the driveway, pushing down the fragility that is life, we instead back up and hear “courage” for what’s at hand. We listen to a child’s fear and loneliness. We stay present with a friend as they describe their teenage son spinning out of control. We visit with a drug addicted mom in the hospital as she holds her newborn. Or we accompany a friend to her chemo appointment. 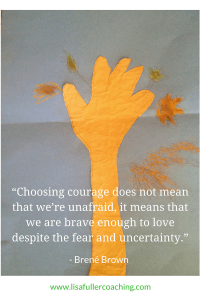 I’m grateful, so grateful that my grandmother declared “courage” that day even though the naming of it hurt. Courage is our action amidst a poignant awareness of the fragility of life. Like a good recipe, even 2 or 3 things that work for your family can change your life.